Though typically translated as "Jewish law," the term halakhah is not an easy match for what is usually thought of as law. This is because the rabbinic legal system has rarely wielded the political power to enforce its many detailed rules, nor has it ever been the law of any state. Even more idiosyncratically, the talmudic rabbis claim that the study of halakhah is a holy endeavor that brings a person closer to God--a claim no country makes of its law. In this panoramic book, Chaim Saiman traces how generations of rabbis have used concepts forged in talmudic disputation to do the work that other societies assign not only to philosophy, political theory, theology, and ethics but also to art, drama, and literature. In the multifaceted world of halakhah where everything is law, law is also everything, and even laws that serve no practical purpose can, when properly studied, provide surprising insights into timeless questions about the very nature of human existence. What does it mean for legal analysis to connect humans to God? Can spiritual teachings remain meaningful and at the same time rigidly codified? Can a modern state be governed by such law? 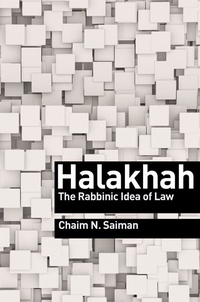 Guiding readers across two millennia of richly illuminating perspectives, this book shows how halakhah is not just "law" but an entire way of thinking, being, and knowing.